50th Anniversary Candy Sampler from the 1960's. Sprinkle these nostalgic candies from the 60's at your 50th Anniversary party for a fun conversation starter and yummy sweet treat. 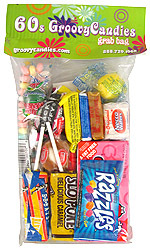 This candy bag contains the most popular candy from the 1960's. They are freshly made and will spark many memories of childhood among the 50th anniversary guests or the couple celebrating their day. Note Candies may vary from what is shown in the picture due to supply at the time of ordering. Visit some other unique 50th wedding anniversary gift ideas.